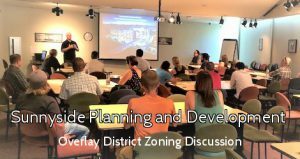 SUNI PCD (Planning and Community Development) Committee Meeting – September – Sunnyside United Neighbors Inc. The Planning and Community Development (PCD) Committee of Sunnyside’s registered neighborhood organization meets monthly to hear about new license, zoning and other applications in Sunnyside. Neighbors also have the opportunity to hear from city officials, developers and others about what’s coming up. We encourage all neighbors to attend any meeting to listen, offer your insight, and help us create a shared vision for development in Sunnyside!